Dr. Massoudi has received 1 award. The overall average patient rating of Dr. Ramtin T Massoudi is Great. Dr. Ramtin T Massoudi has been rated by 19 patients. From those 19 patients 8 of those left a comment along with their rating. 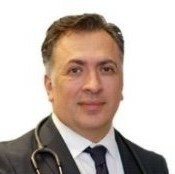 The overall rating for Dr. Ramtin T Massoudi is 4.1 of 5.0 stars.